Traveling gets a lot of flack for being arduous, draining and tiresome. And trust me… I’ve had my share of journeys made in yoga pants! But I just love that it used to be something people dressed to the nine’s for. As my grandmother tells it, you would get dolled up for a flight back in the day, and something about that old-school charm has inspired me to search for travel accessories that add a bit of glam to the mundane. 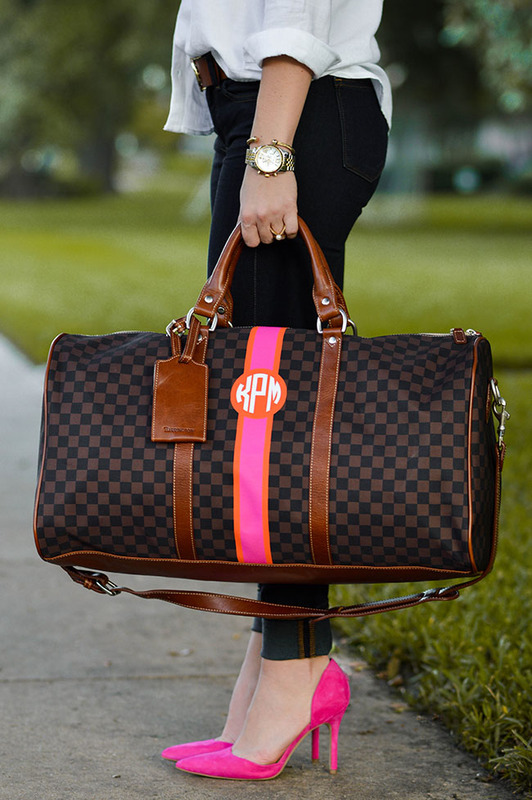 Enter this incredible, monogrammed duffle from Barrington. 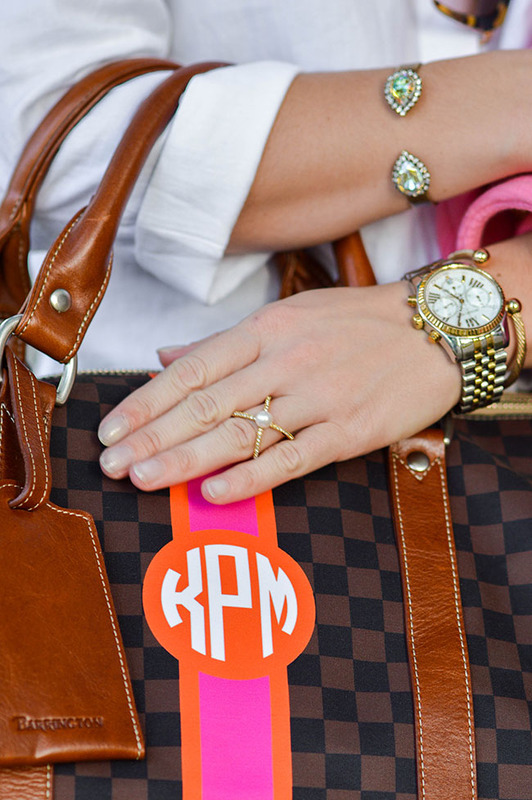 Not only is this bag made of an incredibly sturdy material and beautiful leather accents, it’s completely customizable! That’s my favorite part. Click here to play around with designing your own. I’m confident you’ll find something that adds some pep in your step to your travel just as I did. I just have to gush once more about Barrington. Over the course of A Lonestar State of Southern, I’ve gotten to work with this Dallas-based company more than once. I own and love and wear their St. Anne tote every day, and want y’all to know that I couldn’t stand behind their products more. If you’re looking for a beautiful Christmas gift, no matter who it is on your list, look no further. This tote (a personal favorite) is also customizable and lasts forever, perfect for every gal from high school student to mama! Last but not least, I wanted to give you all a little clue about the upcoming adventure I’m headed on that I hinted on in yesterday’s Instagram. I’m not revealing the final destination yet, but I will tell you I’m crossing an ocean t get there! :) Make sure you’re following on Instagram, Facebook and Snapchat (lonestarsnaps) to be the first to hear where I’m headed! Thank you, Barrington, for sponsoring this post. All opinions are my own. Bilbo Baggins… I’m guessing New Zealand? If so, I’m 100% jealous! That’d be my top pick. Your bag is gorgeous! It’s great to find a brand like that that’s so dependable! Obsessed with this duffle! 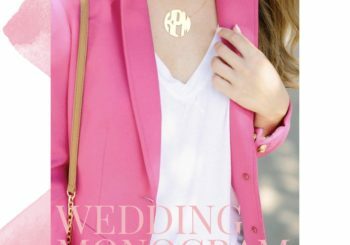 Especially with the touch of pink & monogram. I’ve always been fascinated by dressing for travel too. Really just how people respected dressing in general. I guess people are too lazy today but I’d be fun if more people took pride in dressing for things. 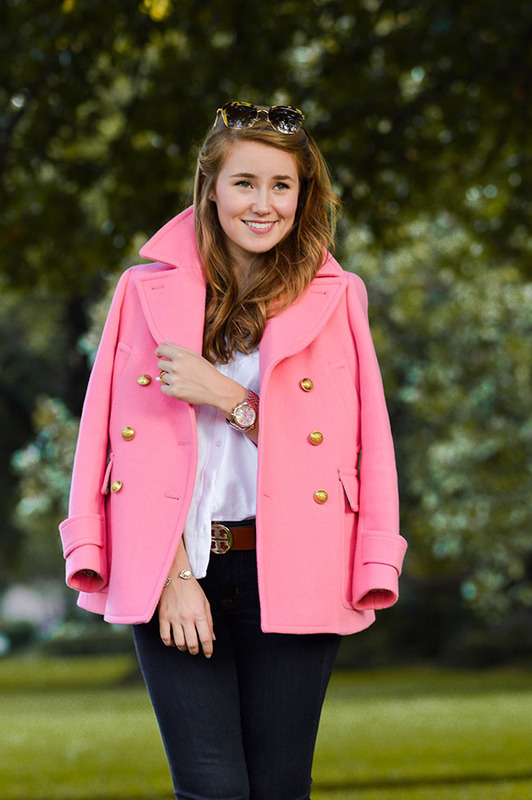 I love this outfit, so classic and elegant and perfect for travel! You have such the best sense of style! Definitely something I wish I could wear!! The Bilbo Baggins quote makes me hope you’re going to New Zealand, but I’m sure anywhere will be so fun! I’m jealous! 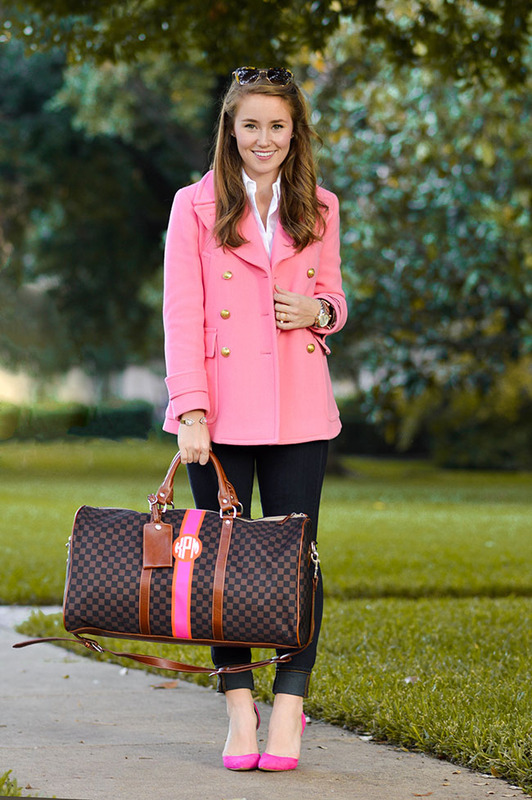 I love this bag and the pops of pink!! ADORABLE! 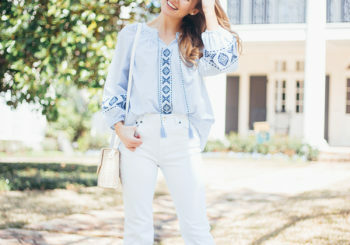 Gorgeous post :) I just love your outfit and bag – I totally agree, a few trips in yoga pants in necessary but there’s something so classic and wonderful about looking your best when you step off a plane! This bag is everything! I am dying to get it now!